FRANKLIN, Mass. 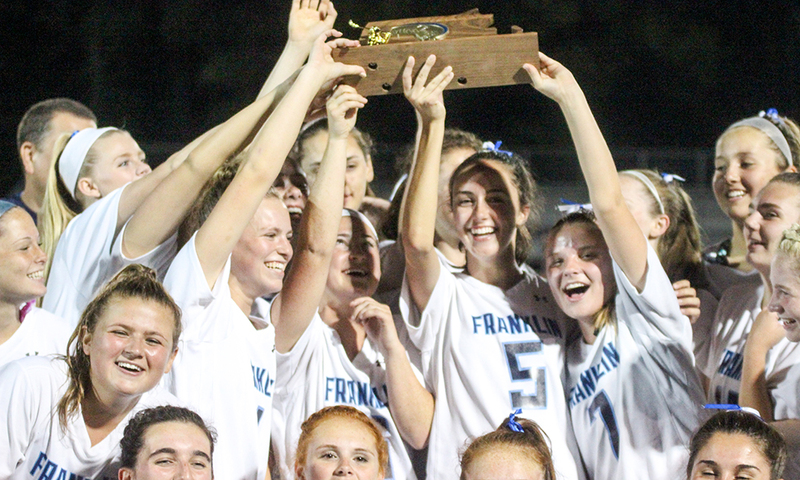 – Franklin and Foxboro have been the dominant girls lacrosse programs in the league for several years, winning a combined 14 league titles in a row (including this spring’s Kelley-Rex and Davenport crowns) and perennially making deep state tournament runs as well. While the two teams have shared success in the league, the head-to-head matchup has recently been one-sided. The games have typically been close, but it is Franklin that has regularly come out on top, as part of the Panthers incredible win streak against Hockomock opponents that stood at 70 games entering the yearly matchup with the Warriors on Wednesday night at Pisini Field. This felt like a year that Foxboro could flip the script and end the Panthers’ long unbeaten run, but instead it was a familiar storyline. Annie and Erin Walsh scored four goals apiece, Franklin goalie Gianna Cameron made eight saves (six in the second half) and the Panthers pulled out an 11-5 victory. 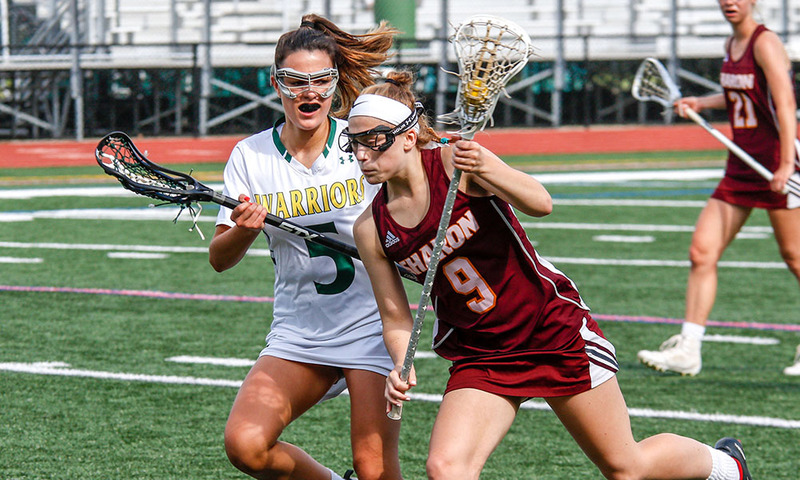 Franklin won 9-of-10 draws in the opening half, which limited the Warriors ability to get the ball into the sticks of their talented attacking corps. Also, the Panthers took full advantage of the opportunities that they were presented with. 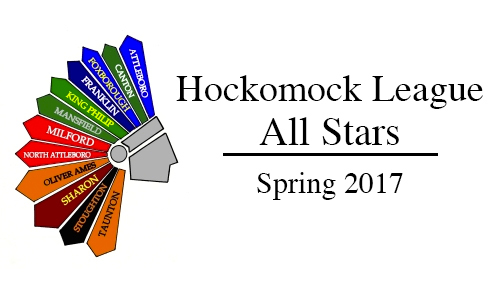 Following a Nicole Houlihan steal, Annie Walsh put Franklin in front with a shot over Addeche’s stick into the top corner. Less than a minute later it was Erin Walsh bursting through the middle of the Foxboro defense to double the lead. The Warriors got on the board three minutes later when senior Cat Luciano found space in the middle of the Franklin defense. Erin Walsh answered back with a pump fake and finish, but Foxboro again got the lead down to one with a lefty shot on the run by Sophia DiCenso. Kelsey MacCallum scored her first of the night to make it 4-2 and then the Franklin defense made several big plays to keep Foxboro at arm’s length. Grace MacCallum was the vocal leader for the defensive unit, calling out switches, slides, and double teams. 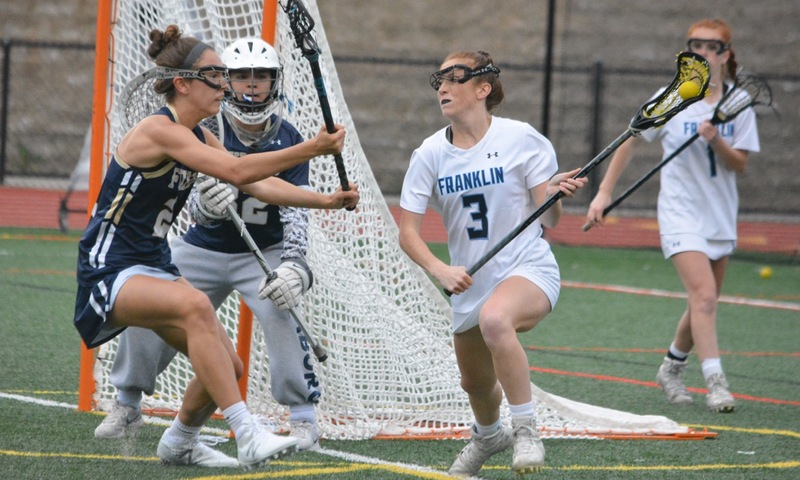 With the help of Halle Atkinson, MacCallum forced a turnover and scooped the ground ball to win possession back and on the other end Annie Walsh went high-to-low for Franklin’s fifth. Foxboro got one back with man-up goal by Molly Murphy off a perfect pass from DiCenso. With three minutes left in the half, Kelsey MacCallum was denied in transition by Addeche, but Franklin forced a turnover on the clearance and Erin Walsh found MacCallum with a precise pass across the crease for a close-range finish. Murphy had one more chance before the half but Cameron read the bouncing shot and was able to deflect it up over the bar just as the horn sounded. At the start of the second half, Foxboro had several chances in the first few minutes to cut into the lead, but Cameron made three saves to keep it 6-3. Franklin then broke the game wide open. 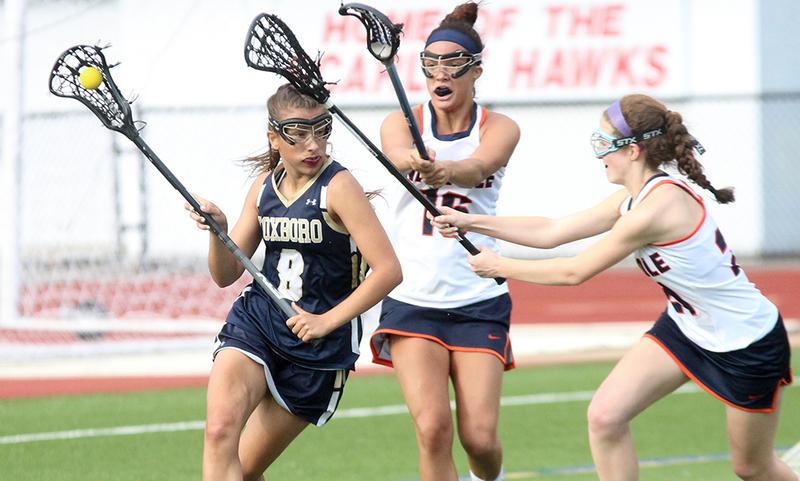 Erin Walsh picked up her second assist when she connected with a cutting Katie Jones and the freshman went behind her back on the run for a highlight-reel finish. Walsh then added back-to-back goals on free positions to put the Panthers up by six. Annie Walsh got into the scoring with a drive from the left side to complete her hat trick. Murphy scored again to end the Franklin run and Mackenzie Cusack got the benefit of a bouncing ball through traffic on what appeared to be a pass that slipped past Cameron to make it 10-5 with 3:31 left, but Annie Walsh scooped a ground ball on the far sideline and took it herself to seal the win. Foxboro came into the game on a nine-game win streak and had key players battling illness, but Sherry admitted that Franklin might be in the Warriors’ heads at this point. Franklin (12-4, 9-0) has not lost a league game since April 2012 and the Panthers will try to complete another perfect league campaign next Wednesday against Canton. Foxboro (11-3, 7-1) will try to bounce back on Thursday with a trip to North Attleboro.